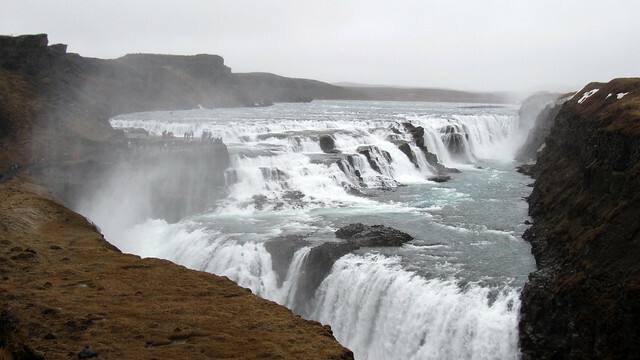 The Golden Circle Tour must be the most popular tour among the visitors. 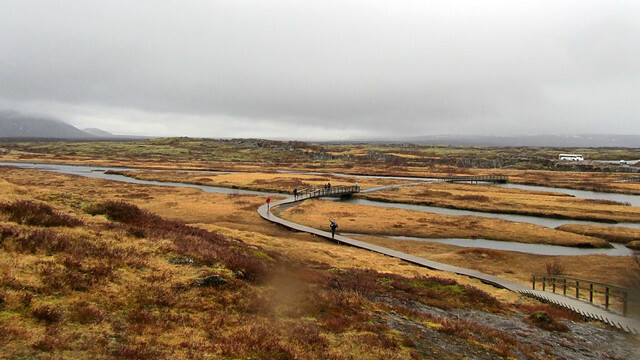 This 300-km loop took us to the historical Skálholt, the geothermically active Haukadalur (geyser actions here), the thunderous waterfall of Gullfoss, and the national park of Þingvellir (Thingvellir). We opted for Reykjavik Excursions over Iceland Excursions, both of which have similar tour duration and comparable price (9,800 ISK vs 9,500 ISK), but the former has free wi-fi onboard (I know, we’re sadly too connected nowadays), not to mentioned I found a 5% discount coupon which rendered it cheaper between the two (9,310 ISK; ~€58). I was a little apprehensive when the bus pulled up at Sunnumörk Shopping Centre in Hveragerði shortly after departure, for the first bathroom break of the day. There’s a free earthquake-based exhibition “Quake 2008” in the shopping centre, of which next to it was an earthquake simulator (fee paying). There’s also a supermarket, a post office, a tourist visitor centre, a couple of gift shops, etc. 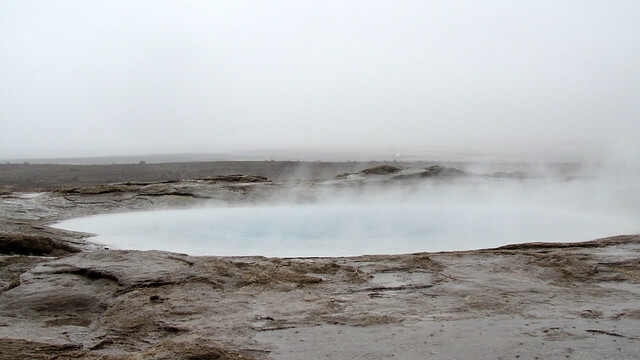 It felt like an Asian overnight bus stopover point… Hveragerði is the hot springs capital of the world, but we didn’t see any of them. Maybe it was the weather, maybe we just didn’t have time to explore some of the hot springs. Whatever it may be, it was such a shame that we missed it. 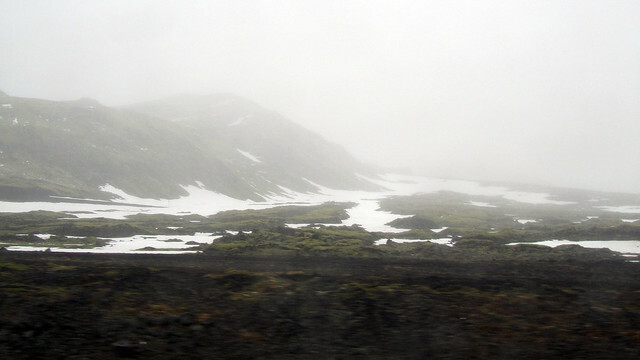 En route to Biskupstungur, we were regaled with Icelandic tales of the huldufólk (hidden people), at times synonymous to elves. Hidden from human sights except to those they choose to reveal themselves to, they live in rock outcroppings. 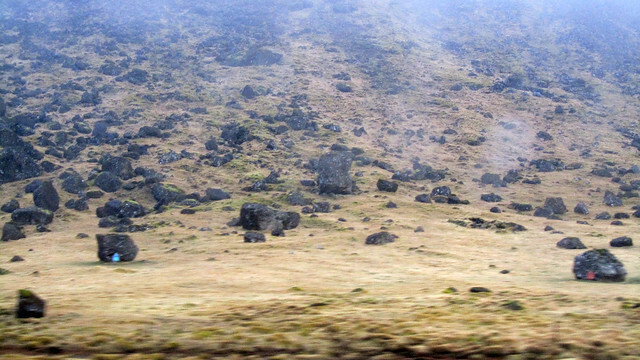 Today, many Icelandics are still cautious about moving/throwing rocks for not wanting to disturb/hurt the dwelling huldufólk. When it comes to construction, an elf expert would be consulted to ensure the project may go ahead, or an alternative solution would need to be found (e.g. building a road curved around a large rock instead of cutting straight through). Not only that, it is not uncommon to see wooden álfhól (tiny elf houses) where there are large rocks. 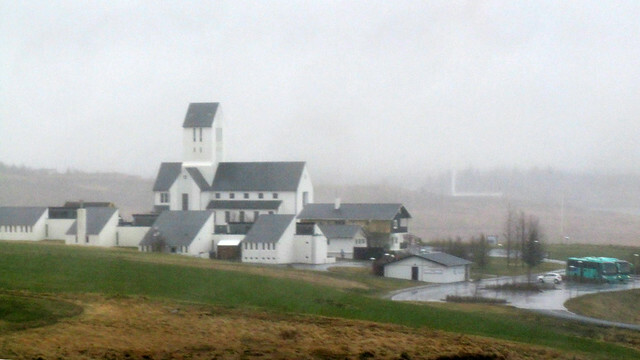 Skálholt in the Biskupstungur valley was the site of the first Episcopal see in Iceland. 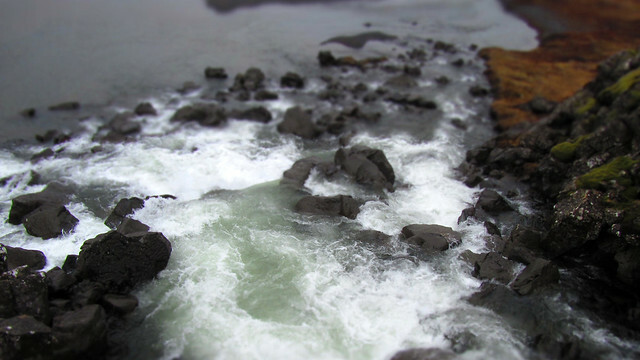 At that time, Skálholt was also the largest and, therefore, an important town in Iceland. 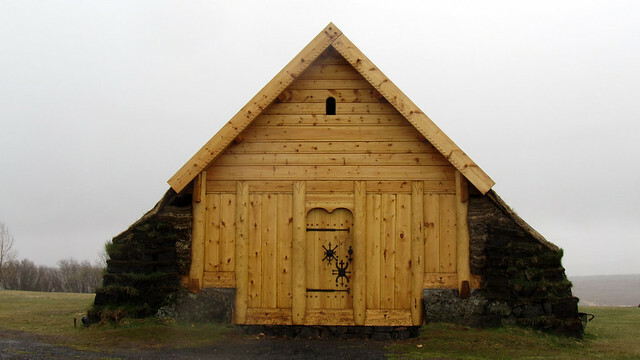 The first school Skálholtsskóli was also built here, with aim to educate the clergy. However, Catholicism in Iceland ended with the execution of the last Catholic bishop of Iceland, Jón Arason, and his sons in the 1500s. 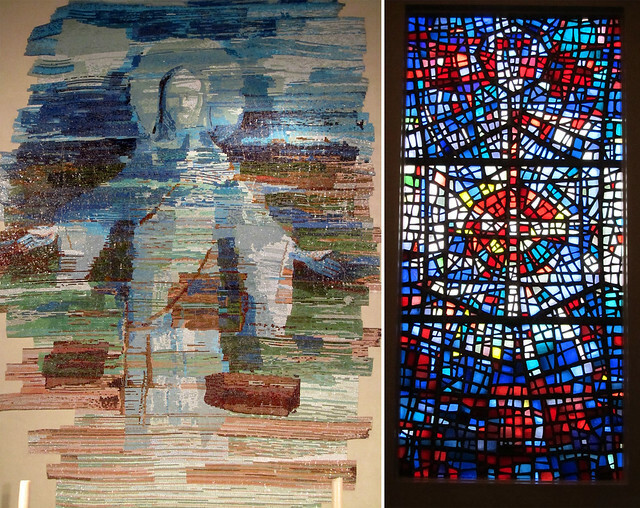 Skálholtdómkirkja (Skálholt Cathedral) is today a main visitors’ attraction, which houses an interesting series of stained glasses by Gerður Helgadóttir whereas Nina Tryggvadóttir created the main altarpiece. We also wandered about the ground a little (in the strong gusty wind) before getting back into the bus, huddling for some warmth. Our next destination was Haukadalur for a little bit of geyser action. The star geysers here are Geysir (the first erupting spring that gives rise to the noun used worldwide today) and Strokkur. 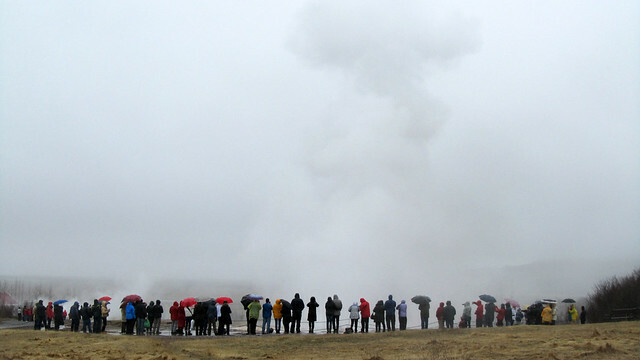 Nearby, a third geyser called Litli Geysir welcomes visitors that are on their way to see Strokkur and Geysir. 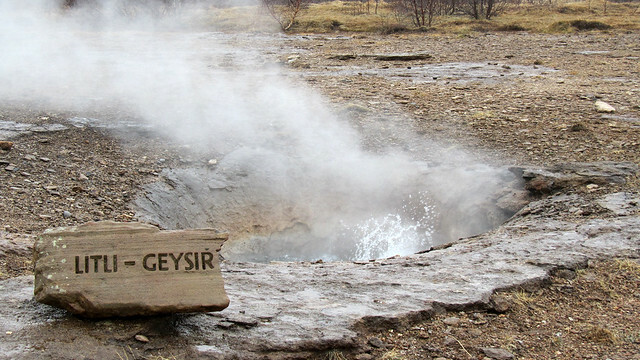 Geysir is the grand-daddy among these geysers but sadly hardly active nowadays, unless an earthquake strikes in the region. It used to spout the pool of hot water up to 70-80m high! 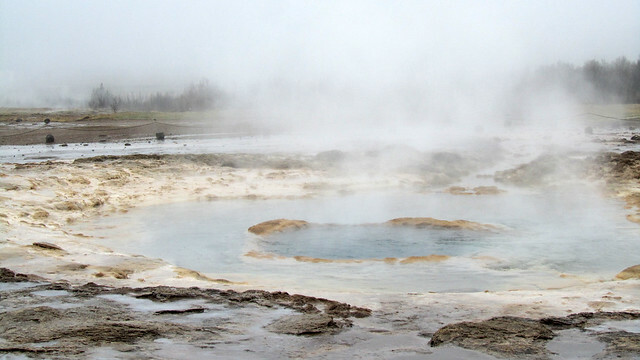 Similarly, Litli Geysir is also inactive, despite the bubbling water. Haukadalur was also our stop for the lunch break, and given the incessant rain and wind, it was a much welcomed break to just be indoor at the Geysir Centre and chomped down something warm that we bought at the cafeteria. 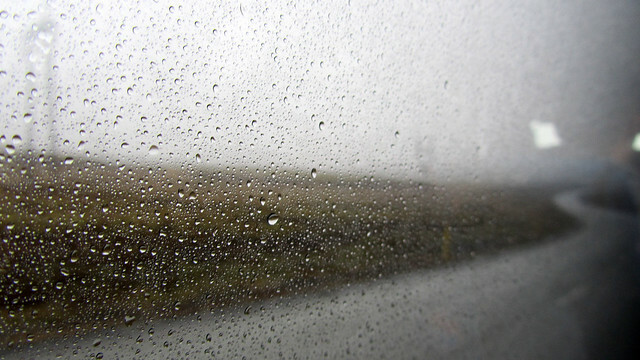 At this stage, LT was getting pretty soaked whereas I stayed surprisingly in a far more comfortable state than she was. 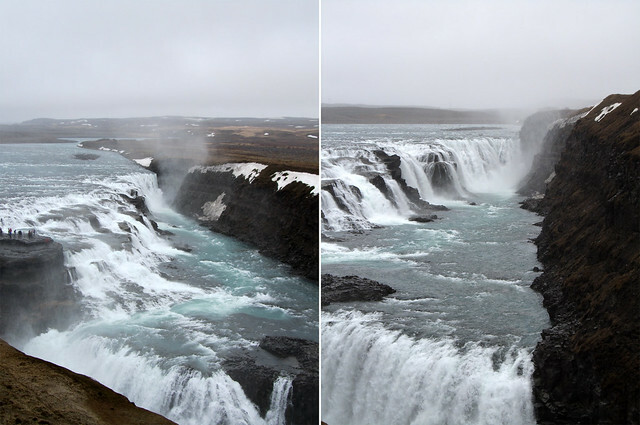 The rain continued to pour when we made our way to the Gullfoss (Golden Falls) waterfall, some 10 minutes drive away from the Geysir Centre. 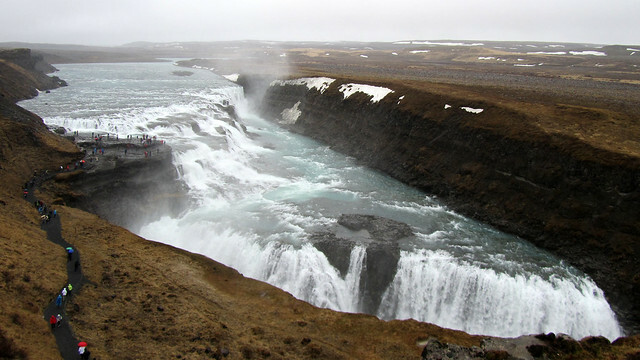 The double waterfall converge in step-like manner before plunging into a gorge that’s up to 70m in depth! There’s a path that visitors can take to get right next to the waterfall. Living dangerously, eh? 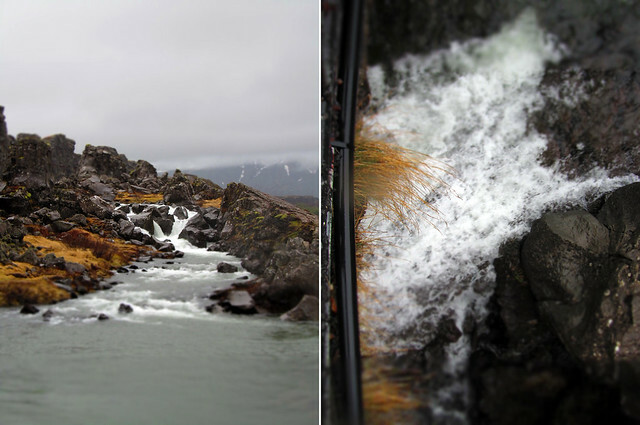 We braved the elements and slippery paths carefully, but half-way down the way to get closer to the waterfall, we decided to not proceed further. First, with the strong wind blowing from all directions, we did not want to risk any incidents. Secondly, the amount of time given to us was short, which under normal conditions wouldn’t be a problem getting close to the waterfall and back, but when treaded carefully under treacherous weather, we wouldn’t make it all the way to the end before having to rush back anyway. I was hoping for a break in the rain so we could photograph the Gullfoss with a rainbow sprawled across it (as seen on our travel brochure) but no such luck for us today. Our final stop on the tour was the Þingvellir National Park, the first national park in Iceland and one of UNESCO World Heritage sites. 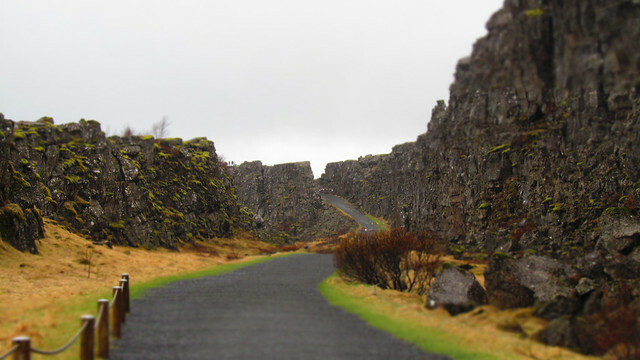 Geographically, it straddles between North America and Europe, forming part of the tectonic plate boundaries of the Mid-Atlantic Ridge. 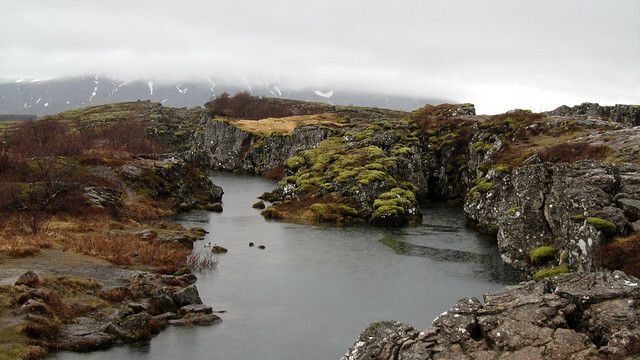 The two tectonic plates are currently pulling away from one another by some 18-20mm per year, which may not sound much, but certainly is causing some visible fissures in the region. Our guide told us that up until a year ago, visitors could cross a part of the rift by foot (“hurrah, we’ve walked from Europe to North America, and back, and over, and back again”) but not anymore, as a fresh fissure of 10-14m deep was discovered at Almannagjá, prompting closure of the walking path. She also warned us to keep an eye on where we stepped on, since it would be easy to miss deep fissures covered by moss (in warmer months) or by now (in the winter). 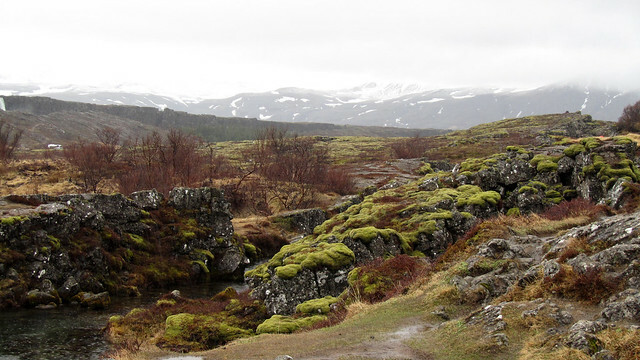 At Þingvellir (Parliament Plains), we were also introduced to the first parliamentary and legislative site in the world, created in the summer of 930. The Alþingi (assembly) ran for about 340 years, a period running in parallel to the Icelandic Commonwealth, gathering members (and citizens wishing to observe/address the assembly) from all over the country every summer. The Lögberg (Law Rock) was the central platform from which the assembly was addressed and from which the laws of the land was recited by the Law Speaker, until the laws were recorded in written form. Beside the assembly, the citizens that gathered pretty much took advantage of this nationwide gathering to trade, to network and to feast. 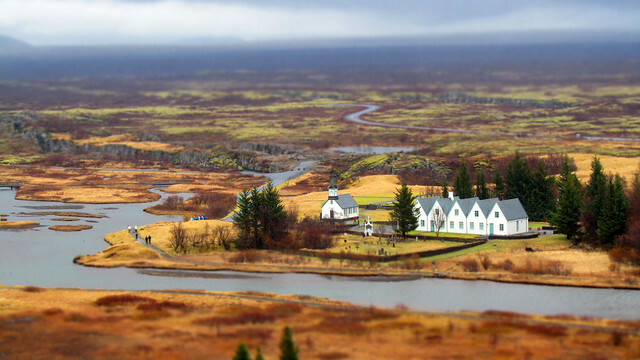 Following the fall of the Old Commonwealth, the site of Þingvellir remained in use to hold court proceedings until 1798, while under Norwegian and Danish rule. When Iceland once again gained independence (from Denmark) to form a republic, the Republican Celebration took place at the ancient Lögberg on 17 June 1944, heralding a significant return of power to the people of Iceland. 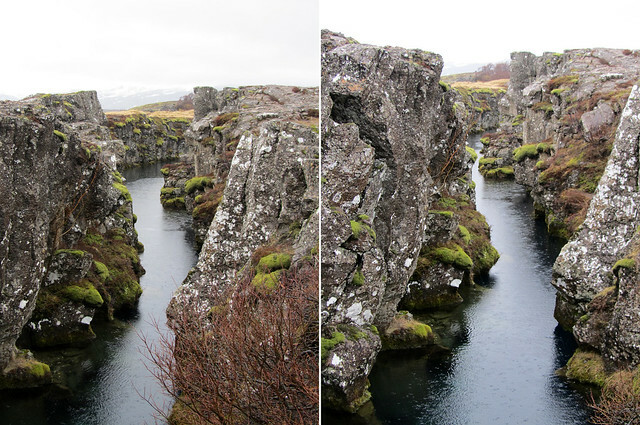 Other features that we were pointed out to at Þingvellir was the location of Silfra – touted the most pristine water for scuba diving with visibility of 150-300m in between two continents (how cool! 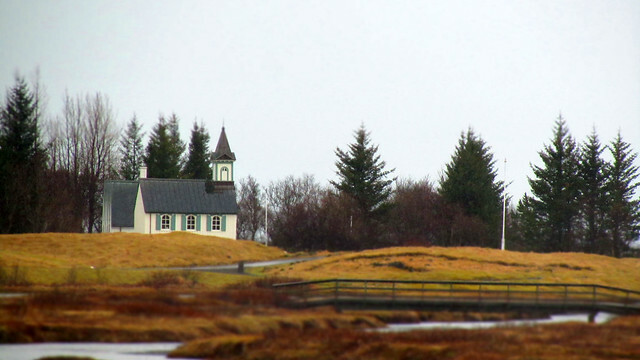 ); former punishment sites such as the Drowning Pool, Gallows Rock, Whipping Islet and Execution Block Spit (don’t commit any crime or the punishment would be severe); the Þingvallakirkja (Þingvellir church) and the few buildings at Þingvellir Farm nearby that’s the summerhouse/country residence of the President of Iceland. In hindsight, had we done a little bit more research, we could have gone on an excursion with a lesser-known company but also handles smaller group at any time. A nearly-full bus of co-visitors did make me feel like one of too many cattles being herded from one spot to another with constant number count to make sure everyone was on board. OK, I may also be just a teensy wee bit miffed that I subsequently found a small group excursion that, because they’re not waiting around for 30+ people to board the bus all the time, they had extra time to see the volcanic crater lake of Kerið and a smaller waterfall called Faxi. 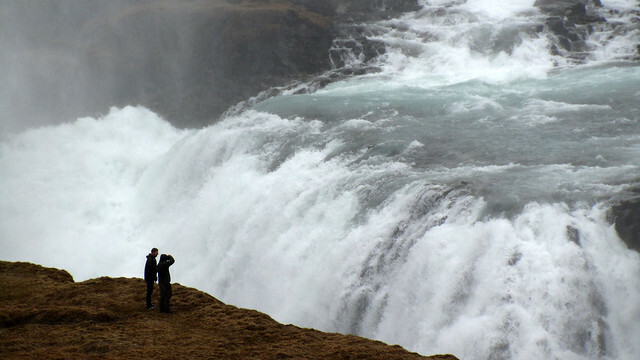 Maybe I should wrangle a few friends who may be interested in an Icelandic roadtrip? The tricky part could be in deciding whether to go in the winter or in the summer. Winter promises a possibility of the northern lights, something which I’ve missed this trip. However, summer offers longer days, better weather condition and for anyone who dive, a great opportunity to swim in the Silfra. Either way, it’s guaranteed to be quite an adventure!